Used 2015 Jeep Wrangler Unlimited Sahara 4WD for Sale in Pelham AL 35124 Lovelady Motor Company, Inc. This is one JKU Wrangler Unlimited that is not easy to miss.... but if you don't act quickly you might. 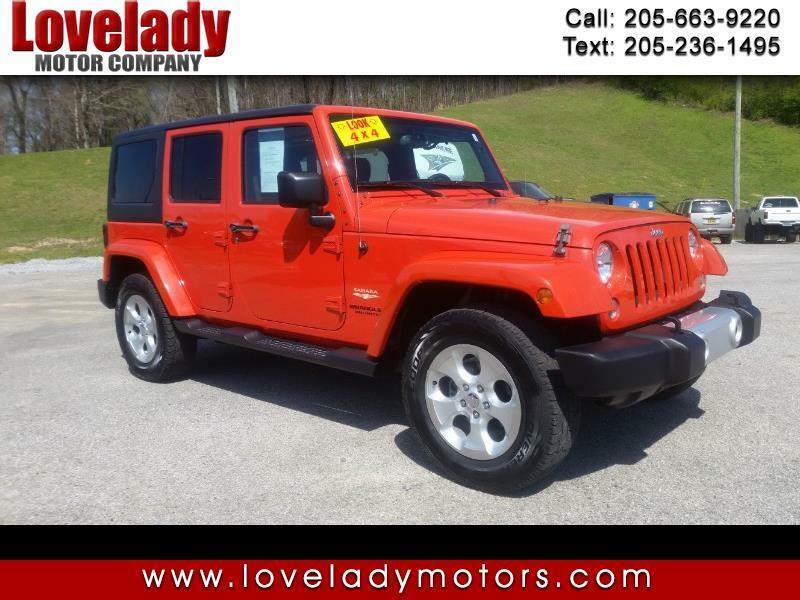 This 2015 four-door Wrangler is clean and turns heads wherever it goes thanks to its beautiful bright orange paint work and sought after Sahara trim level. This JKU has just a little over 100,000 miles on the clock which allows you to have a 2015 model at a bargain price. This one has been well-maintained, drives great and shifts smoothly through its automatic transmission. This Wrangler features two-wheel drive, four-wheel drive high, as well as four low, making it ready for your next adventure. The hardtop provides comfort and security but can be quickly and easily removed along with the doors for great Jeeping on sunny days. This Wrangler Unlimited rides on good Cooper Discoverer AT3 tires and is ready to roll home. Call 1 888 4 x 4 outlet and ask for Keith or Stephen for more information. Financing available with approved credit. Thanks for looking!